Last year saw more than 1 million people cross the Mediterranean to Europe, fleeing their homes and the dire situations in Syria and Libya in search of international protection. While this is only a fraction of the numbers who remain displaced within the region, it represents a spike in refugees on European soil of a scale not witnessed since the Second World War. Europe would do well to ensure these people are best able to integrate – not only out of compassion, but also to enable them to contribute to their new host countries - as workers, as tax-payers and as consumers. So what can countries do to best ensure that humanitarian migrants integrate? Time spent waiting around can damage refugees’ chances of integrating, yet they often have to wait months or even years before receiving language training and other integration support, such as skills assessments and civic integration courses. Countries should both shorten the time it takes to assess asylum applications and provide early support to those most likely to stay. Norway provides a good example in offering up to 250 hours of language training for asylum seekers in reception centres. Many governments disperse refugees across the country to prevent segregation, ensure suitable housing and to spread the costs. When choosing where to send migrants, it is important to consider where appropriate jobs that match their skills can be found. For example, in Sweden migrants are matched to localities based on their overall profile, including their education level and work experience, and in New Zealand, although family or ethnic links are the first factor considered, educational and employment opportunities are considered when there is a choice between resettlement areas. Different refugees require different levels of support – for example those with degrees have very different training requirements that those lacking basic qualifications. While Denmark`s official induction programme lasts three years, it provides language training for up to five years to illiterate refugees. Most unaccompanied minors arrive around the age at which compulsory schooling ends (14-17) but have little or no formal education, and need specific, appropriate support in order to catch up. An example is the US Unaccompanied Refugee Minors programme, which provides intensive case management by social workers, educational support, English language training, career and educational counselling, mental health care, and social integration support. 5. Promote equal access to integration services to humanitarian migrants across the country. Which part of the country a refugee is settled in affects their prospects of integration, as the levels of support vary drastically across countries. Measures to help offset regional differences include the sharing of expertise, ensuring each region or local area is adequately financed, local authorities pooling resources to provide more comprehensive programmes, and monitoring how well local councils are living up to minimum standards. Countries are often reluctant to allow asylum seekers to work as it leaves the asylum channel prone to abuse. They often therefore demand that certain conditions, such as a prior waiting period, are met before asylum seekers can legally work. But not working can have detrimental effects on their ability to integrate in the long run as their skills may decrease and because of the gaps in their employment history. This should also be taken into consideration. Local employers often discount and dismiss foreign qualifications and work experience, with the result that humanitarian migrants with foreign credentials often struggle to secure jobs appropriate to their levels of experience. This is compounded as many fled their home countries with no proof of their qualifications. Countries can help here by assessing and documenting newcomers’ education, skills and experiences. 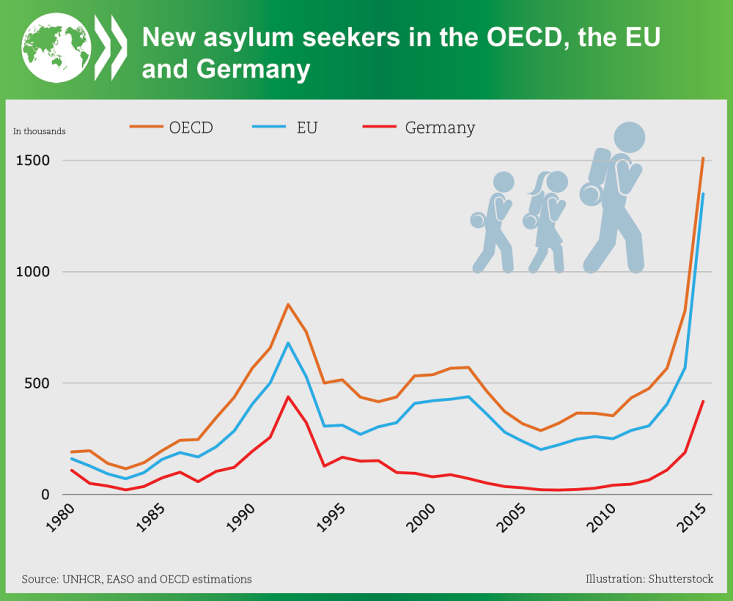 For example, Germany’s “early intervention” scheme, due to be rolled out nationwide, assesses asylum seekers’ professional skills and competencies through samples of their work, building on their declared work history. Poor health affects a migrant’s ability to get a job, learn the local language, interact with public institutions and do well in school – all things that are critical to integrating successfully, with refugees particularly prone to mental health issues such as anxiety and depression, following their often traumatic and violent experiences back home and in flight. Host countries should assess the mental health of newcomers alongside physical evaluations, grant humanitarian migrants access to regular healthcare and ensure they are able to use it. It is not only government which is looking to support refugees to integrate: employers, charities, immigrant associations, community based organisations and trade unions all have a role to play. For example, by implementing government policies, developing mentorship programmes, appraising refugees’ skills and welcoming newcomers to the community. The Chamber of Commerce in Austria provides an example, putting in place language training, skills assessments, mentorship programmes and apprenticeship placements for humanitarian migrants in many parts of the country. While long-term support is expensive, it pays off in the long run, even benefiting the children of refugees who might otherwise struggle with integration issues themselves. For example, Denmark’s “Stepmodel” policy gradually leads new arrivals and longer-term immigrants into regular employment via intensive language training, an introduction to the workplace, and subsidised initial employment, which can be combined with further on-the-job language training and up-skilling. The OECD's recommendations are only one of a number of contributions on this topic and other international organisations, such as the IMF, IOM and UNHCR, have important perspectives to bring into this discussion as well. But what is clear is that we need to pay close attention to how to best support the integration of refugees, for the sake of the refugees themselves and host countries alike.